There has always been an inconsistency in the combination of two electronic devices that go hand in hand. Consumer home video technology existed for years before somebody combined a VCR and television; the same went for DVD/TV combos. And when computer desks became overly cluttered with hardware, the printer/scanner/copier/fax machine combo was born. 3D printing has luckily caught up to the curve. 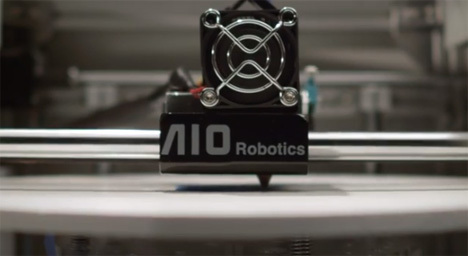 AIO Robotics has announced their plans to create a combination 3D printer/scanner/copier/fax machine. Resembling a sleeker version of a kitchen appliance, the device features an ARM-based computer that allows it to function free from your PC. The built-in scanner uploads images in HD to a cloud system, where the final 3D rendering is done. 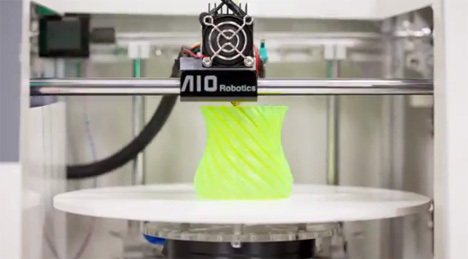 As for its 3D faxing capabilities, AIO Robotics is leaving us in the dark for now, although we assume it will work the same way the scanner does. On a RepRap message board, they state that “it will be significantly cheaper than the Makerbot Replicator and Digitizer,” a setup which currently runs around $3,000.